My studio Fridays this year have been devoted to getting the yarn and design ready for a new large tapestry. I don’t have a name for it yet, but the inspiration came from my artist residency at Petrified Forest National Park way back in 2016. That experience made me think a lot about time. Petrified Forest does have a lot of petrified wood—trees that grew when Arizona was near the equator and fell in some great event 220 million years ago. The park is also full of amazing landforms that are stratified. As you walk through the landscape you’re walking through landscapes formed during entirely different time periods. The only way I know to travel through time in a single day. During my month at that park, I did a daily 2 x 2 inch weaving every evening about my experiences in the park that day. I spent much of my time hiking, sketching, and taking photos. In my little casita after the early winter darkness fell, I had many hours to do some weaving. On day three of the residency, I wove a piece about the layers I saw everywhere. That idea of layers of time has been part of much of my tapestry work over the years. The piece I’m working on now is in that same vein. I thought I’d shard some of the process I’ve gone through the last few months in choosing colors for it. For me, that means dyeing. 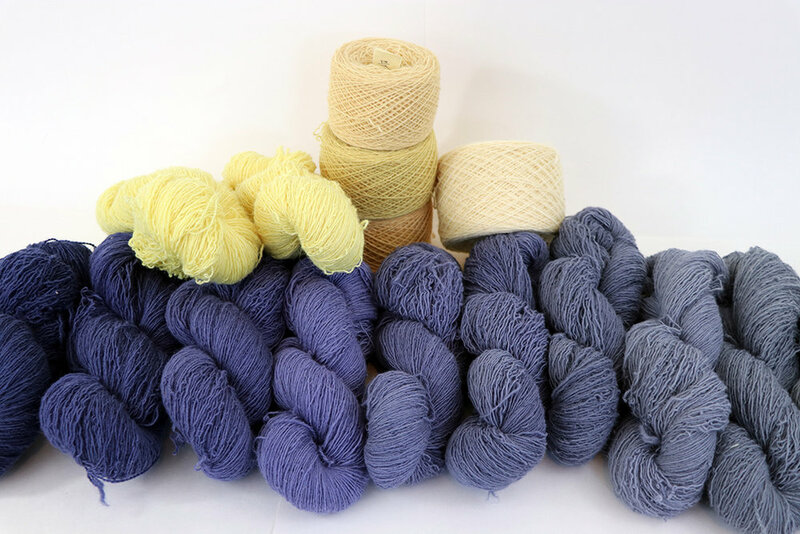 I use acid wool dyes and have a lot of experience making various colors. Still, there are always combinations I haven’t tried and for each tapestry I inevitably end up doing a lot of sample dyeing. On the blog last week I talked about how I do this sample dyeing and the dye process in general. I thought I’d share a little more about how I pick the colors to start with. The cartoon I’m working on has basically four color areas. This is not the actual cartoon. I’ll show that to you when I’ve made some final decisions and have the weaving underway. But this is how the colors are divided up in the piece. I want the vertical bars which will have stacked layer forms like the Petrified Forest Day #3 piece to stand out almost in a three-dimensional way. So when considering colors I have to work with both the hue and the value. If the value of the background is the same as the focal forms, they’ll all blend together and potentially be fairly uninteresting. Like most of us humans, I start with a color that I love. For most of my tapestries it seems that color has been violet or blue-violet. For this tapestry I wanted to use a huge collection of colors I had already dyed for a commission that didn’t happen. There are two colorways that go from teal to violet. One is more saturated, one has more black in it. Here are the two different gradations in yarn wraps. The colors in this gradation are analogous. They are next to each other on the colorwheel. I want to break out of the analogous colorway for this piece and so I start looking at what colors are across the color wheel. Complementary colors are a great choice if you want to create contrast and the most vivid interaction between colors. The complement of blue-violet is yellow-orange. I had some colors in this range from a previous project and I dyed a bunch more for the top background colors of this tapestry. The basic color harmony I’m using here is more of a split complementary. And you’ll see in following pictures, I branched out to a few other colors I’ll use for outlines and other forms. I use this split complementary color scheme more than any other color harmony. I had a fairly large variety of yellow and yellow-orange yarns from another project. I added some larger amounts of light yellows. These will go behind the most violet and darkest part of the foreground image. The use of complementary colors plus a light value should help support the central figures. Next I have to have the cartoon blown up and do some woven sampling. And I just realized the loom is warped at 36 inches wide and I need it to be 45 inches. So warping will happen also. The final piece will be six feet square. 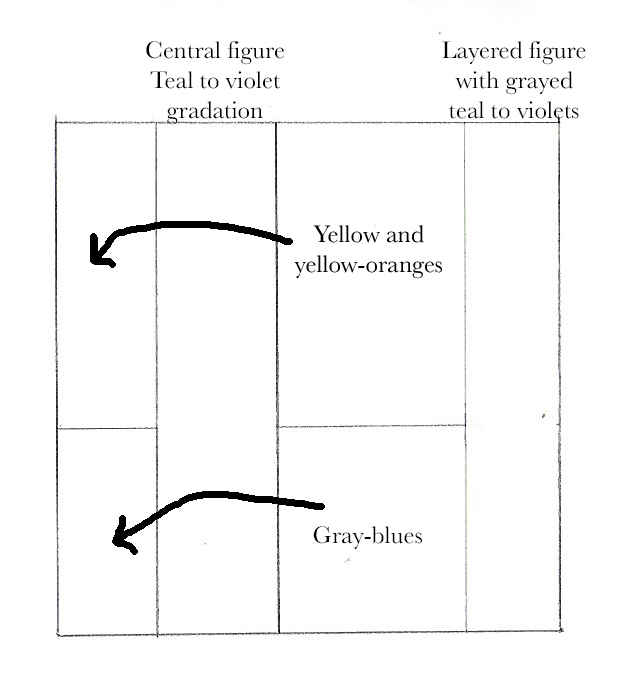 Blue-Violet gradation with both depth of shade and formula changing. More saturated to more black. 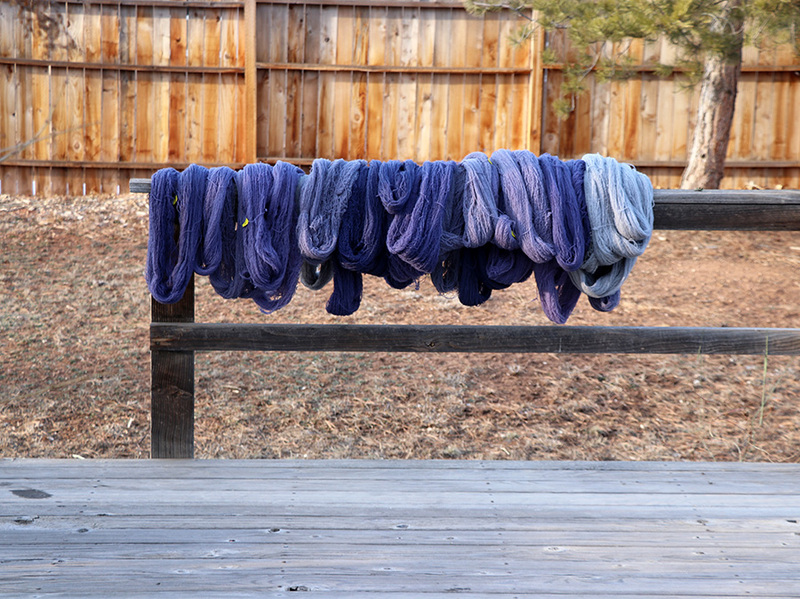 Rebecca Mezoff, Blue-violet hand-dyed yarns for a new tapestry. I am not entirely sure about the way I’ve planned to do the two background areas, so woven sampling will make me feel better about that. I usually do that on a separate loom so that I can quickly look at color combinations as the tapestry is under way. Some people do a sample in the area that will be waste yarn before they start the tapestry. But I like being able to test things out as I go. One of my Mirrix looms will be used for this. I’m keeping my fingers crossed that my brain will not demand that I dye any more colors.